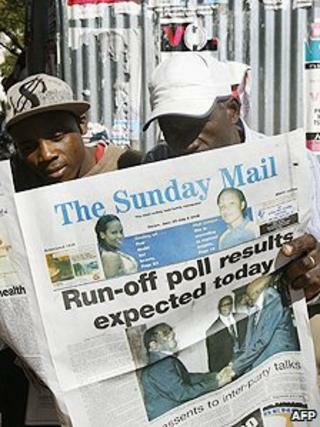 All broadcasters transmitting from Zimbabwean soil, and many of the main newspapers, toe the government line. The main pro-government dailies, the Harare-based Herald and the Bulawayo-based Chronicle, are tightly controlled by the Information Ministry. The private press, which is relatively vigorous in its criticism of the government, has come under severe pressure. Newspaper cover prices are beyond the reach of many readers and publishers have been hit by escalating costs. Draconian laws and institutions, along with prison sentences for "publishing false news", are used to clamp down on critical comment. Journalists who fail to register with a government body risk imprisonment. Radio is the main source of information. State-owned Zimbabwe Broadcasting Corporation (ZBC) operates two TV networks and four radio stations. Two national private FM radio stations are licensed. There were around 6.7 million internet users by 2017 (Internetworldstats.com). US-based Freedom House says the internet is nominally free from government interference. However, the medium is relatively expensive and prone to disruption because of power cuts.